Robert Kaufman should be contacting her shortly. Thanks so much to all of you who left comments. I am so glad you like my first collection for Robert Kaufman and wish I had a ten square to give out to each of you. After you have made your wonderful creations, please post them on the Ambrosia Flickr Group – I’d love to see what you make! (And if any of you make any photo albums, bags, or Yo-Yo Pillows in any fabric, please post them to my Patterns Group.) I’m also considering selling some fabric packs via my website – maybe 1/2 yard cuts – but first I have some sewing to finish up first! 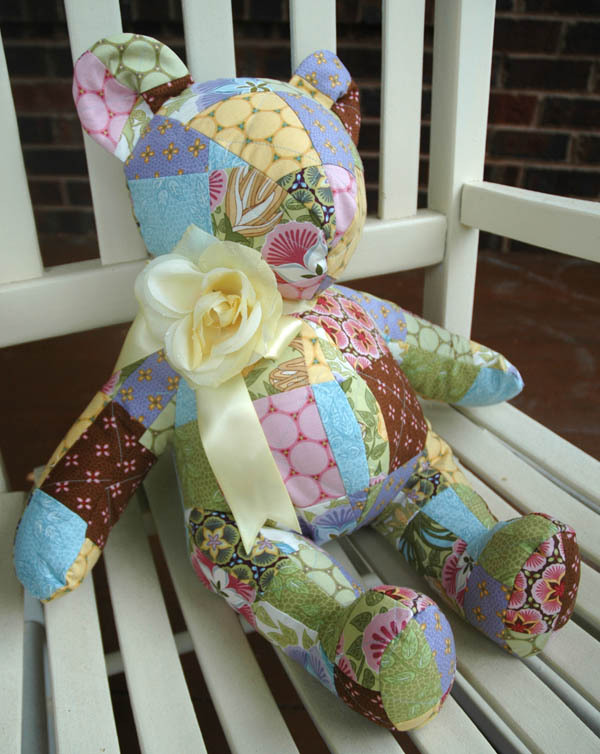 Yesterday I shipped Ambrosia Bear to Market. She was made from a pattern from Dreamspinners called “…and the Three Bears”. I think we will name her Flora. She would have just been a lumpy, less-than-plump mess had it not been for the labors of my Ironer-turned-Bear-Stuffer, who does not enjoy stuffing bears, but who does so willingly because I do her laundry and drive her to ballet. Thanks Ironer-turned-Bear-Stuffer! Incidentally, the flower fastened to Flora’s neck is her inspiration. And last, but definitely not least, a big thanks to Jaybird Quilts for organizing the Ambrosia Ten Square give-away. Thank, Julie! I've already been contacted and am excited to receive it. I really like that there is a mix of patterns and solids of Kona Cotton in it. Congratulations Sequana you lucky girl!